Church of the Redeemer has a long heritage of worship expressed through the arts. 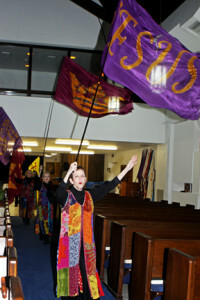 We use many forms: music and singing, visual art, drama, folk and liturgical dance, and flags and banners. The expression varies with the season and particular Sunday. Our musical style blends traditional hymns with more contemporary praise music. We use organ and piano as well as guitar—and occasionally bass guitar, electric guitar, accordion, trumpet, and drums. Using flags and dance in worship is not original to Redeemer, as these are ancient practices mentioned often in the Old Testament. Flags are used in almost every service by a team of dancers who serve much like the choir. (Anyone is welcome to join the team and receive training.) The flags’ colors and symbols are chosen to correspond to the text of the music and scripture for that Sunday. The flags themselves are beautiful, made of silk and hand painted. Their use is joy filled and an extravagant, exuberant form of worship that is intended to honor God and draw the congregation into worship. We often receive inquiries about the availability of music that was written, performed, and recorded at Church of the Redeemer, Episcopal. A significant portion of the music that was recorded by the Redeemer Choir and by The Fisherfolk is still available on CD from the music store at The Community of Celebration in Aliquippa, Pennsylvania. You may order CDs online, or you may order from them by phone at (724) 375-1510. E-mail the Community of Celebration if you have any questions. Several online downloads are available for purchase through the Celebrate the Whole of It website. These include music by Diane Davis Andrew and Wiley Beveridge. Two 50-minute music compilations (Life Together and Sing to Jesus) are available for download at $4.99 each.